NoVA drivers are urged to find another route as the northbound lanes of GW Highway will be closed for an extended period of time. 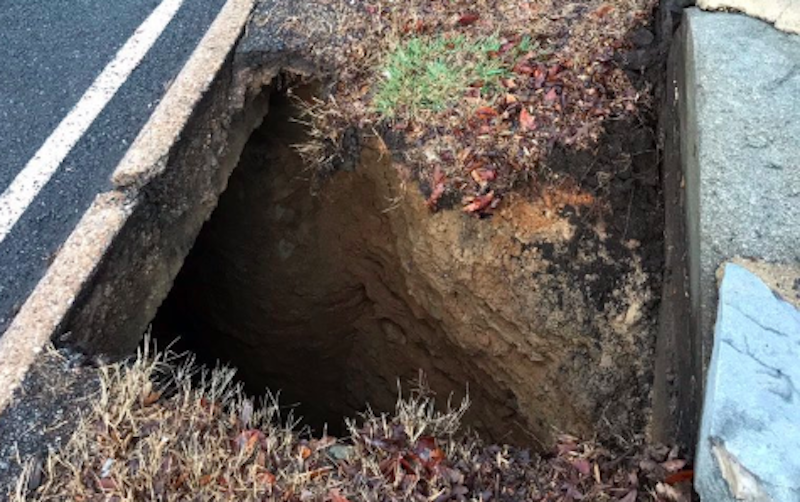 A portion of George Washington Memorial Parkway has been closed "indefinitely" due to a massive sinkhole that formed under the road overnight, at Deep Run Creek. The sinkhole affects the road between I-495, the Capital Beltway, Virginia Route 123, and Chain Bridge Road. According to 4 Washington, the sinkhole was formed likely because of a storm pipe that opened deep underground. Other causes are still being investigated. The parkway is deemed unsafe for drivers to cross over and will only be reopened when it is safe. The northbound and southbound lanes were closed at 7 a.m. Friday morning by police, but the southbound lanes will be reopened shortly once the area has been taped. According to a report by Big 100, the Federal High Administration has engineers inspecting the highway and are predicting that the area will be closed for an extended period of time. 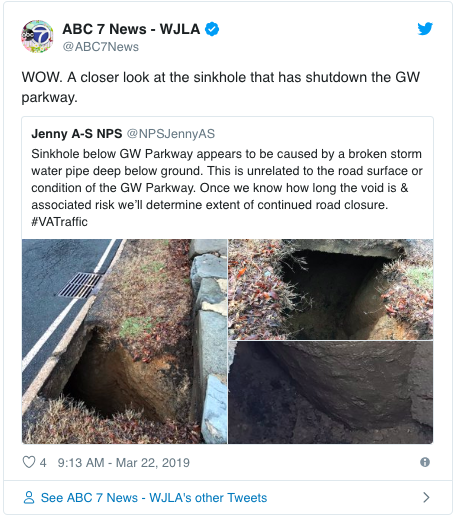 According to Jenny with the National Park Services stated, "Sinkhole below GW Parkway appears to be caused by a broken storm water pipe deep below ground. This is unrelated to the road surface or condition of the GW Parkway. Once we know how long the void is & associated risk we’ll determine extent of continued road closure." Over two inches of rain fell in the D.C. area on Thursday, which may be a factor in the forming of the sinkhole. Crews were seen shoving several feet of measuring tape down the sinkhole to determine its size. For now, cars are urged to turn off the GW Parkway near Turkey Road. Did you see this sinkhole this morning? Was your commute much longer because of the closure? Tell us in the comments below! D.C. is getting a special 7-Eleven! And by special, we mean coffee shop/bar/fro-yo/taco joint.